For the fourth consecutive year, Goût de France / Good France has been a fun celebration of French cuisine around the world in an event organised by the Ministry of Europe & Foreign Affairs and Chef Alain Ducasse. This year too on 21 March, Goût de France / Good France brought together over 3,000 restaurants in 150 countries across five continents to celebrate French gastronomy. This international event, which was first held in 2015, follows UNESCO’s decision to put “gastronomic meal of the French” on the intangible cultural heritage list. According to the guidelines, a Goût de France menu should include an aperitif with finger food, a starter, one or two main course(s), a cheese platter and/or a dessert, accompanied by French wines and champagnes. In India, the event was supported by 63 restaurants across the country. Chef Ajay Anand, Director of Culinary, Pullman & Novotel new Delhi Aerocity, shared that chefs are nominated by the French Embassy. Chef Ajay’s cooking style has evolved from the techniques and flavours from cultures around the world, but is rooted in classic French traditions. 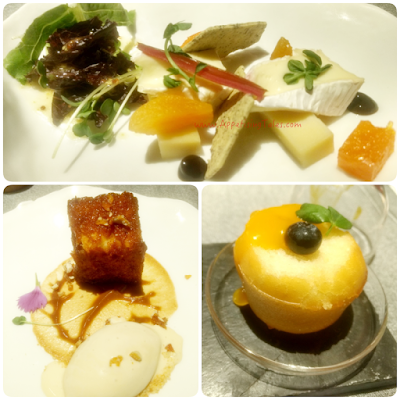 In his second consecutive year of celebrating the event, Chef chose classic French dishes that were paired excellently with French wines chosen by wine sommelier, Kriti Malhotra. Top: Wild Mushroom, Truffle Parmesan Choux. Bottom: Chicken Liver, Sowbelly Terrine. Each course had an option for vegetarian as well a non-vegetarian dish. The amuse bouche was a baked purple potato with cream cheese, and pickled cod with tobiko. Both presented beautifully in keeping with the style at Pluck. We started the meal with a melt-in-the-mouth choux stuffed with wild mushrooms with an accompanying truffle parmesan jus. The chicken liver and sowbelly terrine with celery marmalade, berry glaze and sourdough strings created a beautiful symphony on the palate. This course was paired with a refreshing Maison Louis Latour wine from Macon Village Chameroy, Burgundy, France, 2013. Top: Baked Three Cheese, Artichoke. Mains included a three cheese bake with pickled artichokes, tenderstem broccoli and a mustard dill emulsion. The freshness of all the veggies is enhanced by the fact that they are all grown in-house, literally from farm to fork. The sea bass with a deliciously crisp skin complemented wonderfully with the finest pommes anna I have ever tasted! 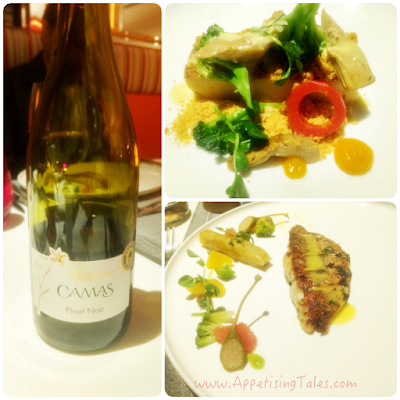 The accompanying Camas Pinot Noir, Languedoc-Roussilon, France, 2015 turned out to be a luscious red wine. peach apricot, chive cracker, pickled celery. Bottom R: Baba au Rhum. 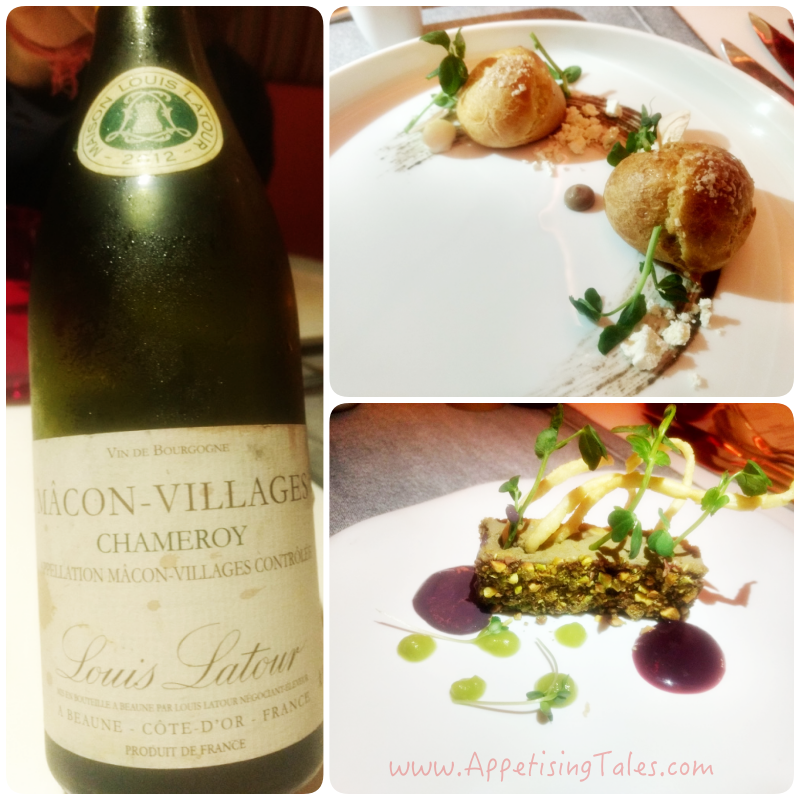 Even though whatever was served till now was top notch, I was eagerly awaiting my favourite course – the cheese platter! Out it came with Camembert and Gruyere with an assortment of kumquat compote, peach apricot, chive cracker and pickled celery that reminded me of rhubarb. And finally, the desserts to round off this soul-satisfying meal included a choice of Pain Perdu and Baba au Rhum. Since my companion and I had decided to order different dishes for each course so we could taste a bit of each, so was it for the sweet ending. As expected, Baba au rhum came soaked with a boozy-sweet syrup and while pain perdu may simply translate into French toast, this one accompanied with caramel ice cream, crushed nougat and chocolate dust was perfect to end the meal on a high note. Finally, I must add that the lively din of happy diners in the restaurant, many of whom were French, added to the celebratory appeal of the evening.